Technology. A lot of times we see that word as an expensive term. Technology comes at a price, and not a “singularity” fear price (that’s a note for another day), but an actual dollar amount. Since I do the finances in my household every time my spouse wants a new computer, and he is a technophile, I cringe a bit. I mean, what has come out in the last two years that you need an all new computer!? But he always has a solid argument as to why his two to three-year-old computer needs to be updated. 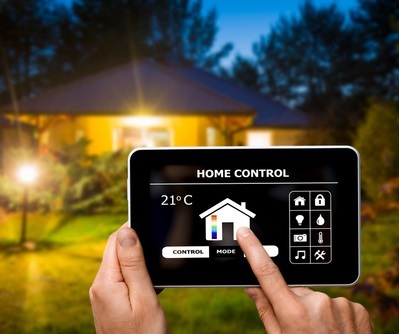 So, it’s no surprise that he was the one that wanted to jump feet first into a Smart Home makeover. We have been slowly converting our home over to a Smart Home. The biggest ticket item, a Tesla solar roof is on the “Waiting till the price comes down,” list. But about a month or so ago I found a piece of Smart Home technology that I have been drooling over, a new Samsung 4 door Refrigerator with a touch screen built in, at Goodwill. Yes, you read that right, and maybe reread it. As the keeper of the purse strings in the house I knew that the price tag was about half that of the ones I had been coveting every time I passed them over the last 2 years. It was an overstock item with a few small dents, nothing my 5-year-old couldn’t have done on his own in the first week of ownership. It came with the factory warranty just like buying it from a big retailer. I jumped on that deal. I used our tax return to replace the 10+ year old fridge that was currently residing in our kitchen, instilling a constant lingering feeling that I would come down to find a puddle on my kitchen floor again, (the first time we paid for the repair and almost bought a new fridge that was not as great but more expensive), to upgrade to this beautiful piece of tech that any foodie or busy parent could get behind. The price tag on my new Samsung 4-door Refrigerator was about half that of the ones in other stores ($1,980 compared to anywhere between $3,000-5,000). 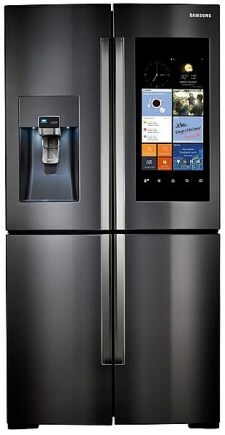 Here are a few of the “Smart” features of this fridge. Just plugging it in. This fridge is very energy efficient, saving money every month! The screen. It is a message center, calendar and recipe box! Use the Samsung Family Hub app to send notes to and from the fridge and your phones. Leave a note on the fridge that family members can also see on their phone. The family calendar is also linked from phone to fridge. View recipe apps on the fridge such as Allrecipes, Yummly and Pinterest and play music from your phone through the fridge speakers! Food Management. There are cameras in the main body of the fridge that let you see in with your Family Hub App. At the store and can’t remember if you have milk? Look right in your fridge from the store! Create a shopping list that is shared across the Family Hub and check off items from the list on your phone as you shop. The Flex Zone fourth door. There is one dedicated area for freezer space (the left door on the bottom) but the right door on the bottom can be designated for wine, veggies, extra freezer space or a few other things and can flex back and forth as needed with a push of a button on the screen. To leave you with this piece of advice: Upgrading can be expensive, but it doesn’t have to be. Make sure you’re watching for sales. We bought many of our Hue lights on sale and our Google Home Minis were either on sale or had a store rebate of some sort (Watch Best Buy and Target for sales). Also, don’t be afraid of refurbished products. They are normally at a large discount even after you add a warranty (which I would recommend on any refurbished item). Above all things, though, never underestimate Goodwill. I find so many great buys there, and not just amazing appliances! Very informative! Thanks so much for the advice, I would have never thought to check a Goodwill location for appliances & certainly wouldn’t have expected there to be a warranty with it. This will definitely help with future purchases in a single mother’s home!